Old Orchard Beach Engagement Photographer - Here our couple is by the pier in Old Orchard beach just outside the arcade. There is a sprinkle of rain the air making a beautiful glowing mist around their faces. This photograph was taken at dusk at Old Orchard beach for their engagement photos. The lights in the fair ground area were just starting to come on and the blinking arcade lights caught my attention. I placed them together in a loving embrace and shot from down low to removed all the busy people traffic walking by. The telephoto lens compressed the scene and made the image look intimate and romantic. The end product was the gorgeous image of them embracing together and enjoying their moment at Old Orchard beach. They were married a couple months prior but didn't have an opportunity to get any engagement shots done. This was their photo session. Personally this is one of my favorite engagement photos as it brings to light the colorful and energetic atmosphere of Old Orchard an a very romantic and pretty way. Old Orchard makes a lovely backdrop for engagement photography offering a gorgeous beach, pier, lively promenade and ocean views everywhere. 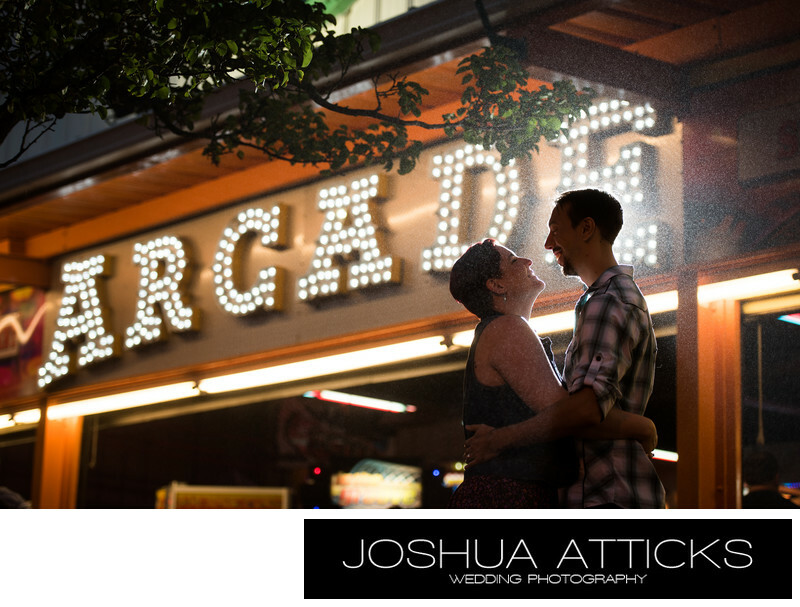 Contact Joshua Atticks Wedding Photography and book your engagment photo session today. Location: Old Orchard Beach Pier, Old Orchard, Maine.